California’s Double Drive Time (DDT) laws are confusing. Many moving customers aren’t aware of this line item on their bill and it often comes with some sticker shock. However, under CPUC legislation all licensed moving companies must charge DDT when billing their client. Believe it or not, the law was created to protect the consumer by defining points within the job and ensuring that the consumer only gets charged for time spent on their move. Do your homework before your next move and understand how DDT should be charged by your moving company. 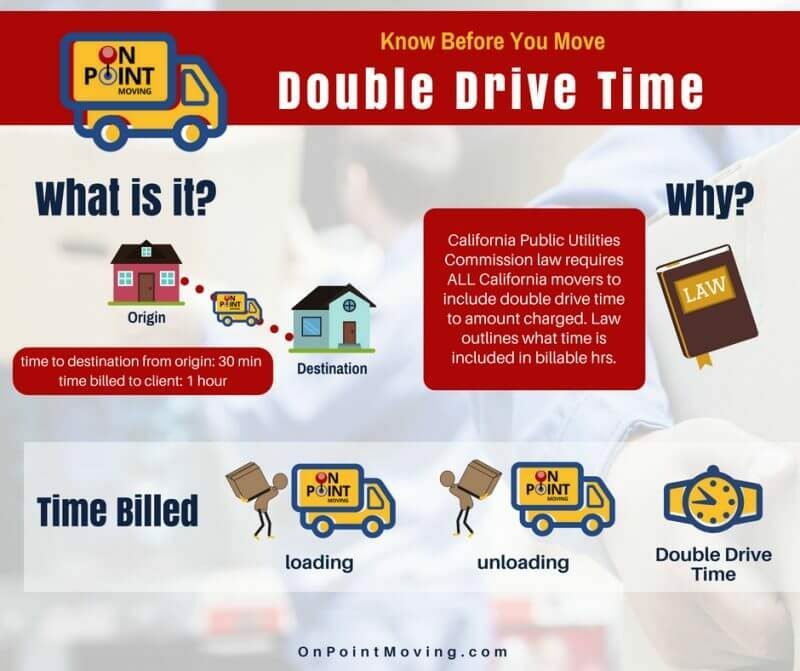 Moving customers are to be billed double the time it takes to drive from the point of origin to the final destination. Point of origin is the starting point for the moving work. This is not to be defined as the moving company’s depot or warehouse space, but rather the physical location of your old home. This is to be defined as where the work ends. Again, not the company’s depot or dispatch point, it is the physical location of your new home. There are three (3) defined exceptions to DDT made by the CPUC in its Max 4 Tariff guidelines. 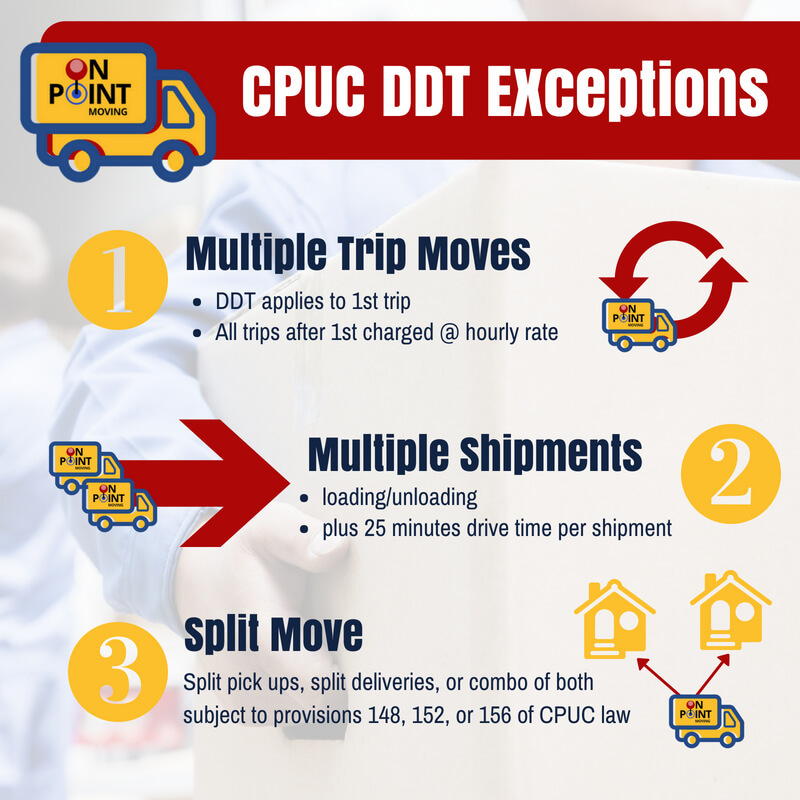 These include moves that require multiple trips, moves requiring two or more shipments to be transported at the same time, and moves that require split pick up, delivery or a combination. What does that mean to the bottom line of your moving budget? This scenario is a move that cannot be completed in one trip. 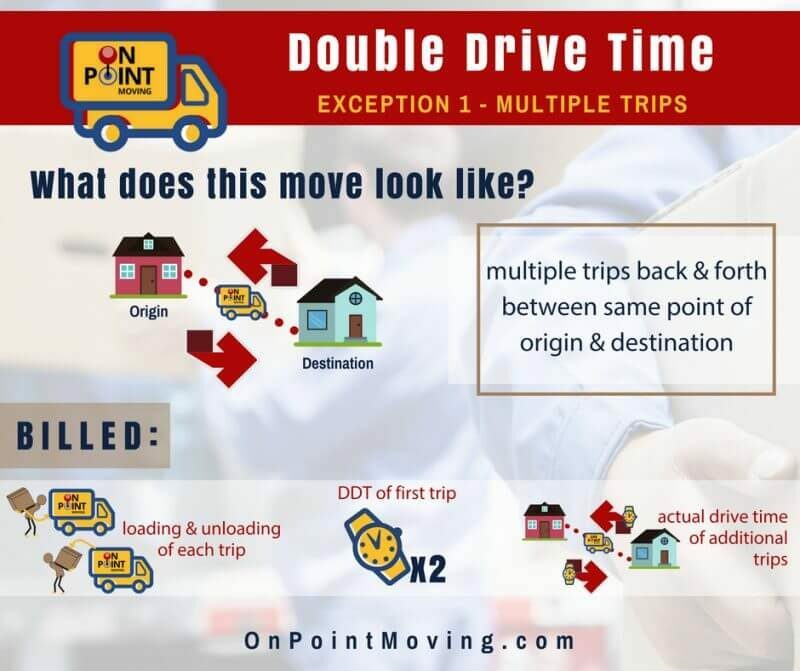 Multiple trips back and forth need to be made between the point of origin (home you are moving out of) to the final point of destination (new home). Rates billed will be charged per moving truck the moving company supplies for the job. This scenario is a move the requires two or more trucks to move a single unit of equipment during the same time period. Multiple Trip Moves? Multiple Shipments? We can help! These scenarios can be complex. 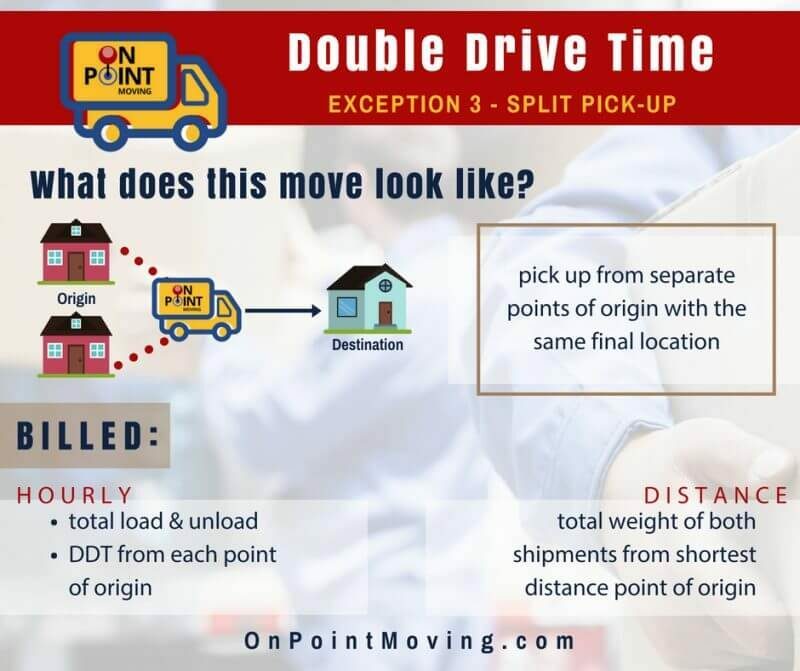 Because it revolves around a lot of different factors based on whether it is considered a local move versus a distance move – Each type of move is billed differently depending on what the move is classified as. The way these moves should be by weight for distance moves or on an hourly rate for local moves. 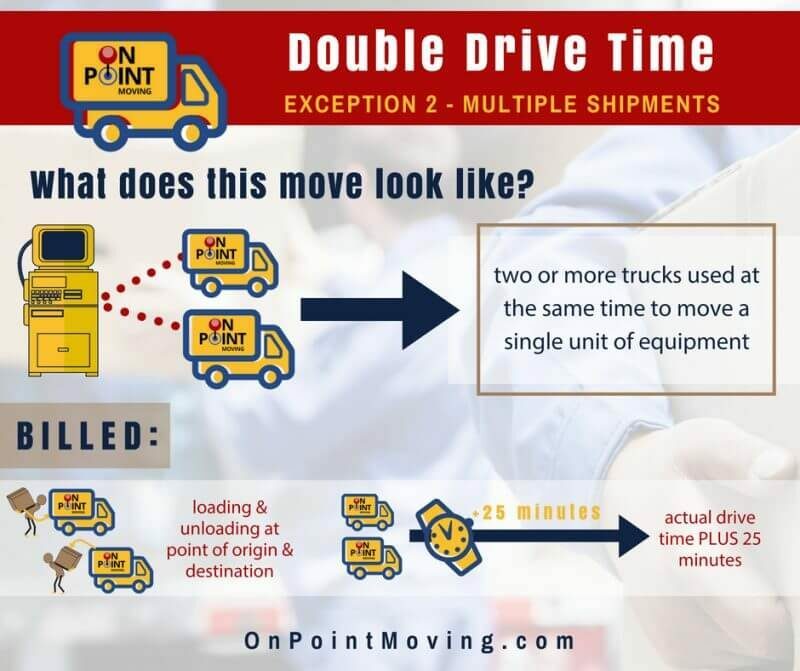 In this case, the exception would apply to a move that requires a pick-up of items at two or more separate points of origin that will be transported to the same point of destination. The way that this scenario is billed depends on whether or not it is considered a local move (less than 100 miles between the point of origin and destination) because that directly affects the move’s rate – based on hours worked or weight of the shipment. Total loading and unloading time of each point of origin. DDT from each point of origin to destination. Total weight of both shipments to point of destination from shortest point of origin distance. In this scenario the move includes pick-up from one point of origin that will be split into transport to two or more separate points of destination. Same as the split pick-up scenario the way this type of move is charged depends on what the rate of move is. Total loading and unloading time of pick-up and each delivery point. DDT of each point of destination from the same point of origin. Total weight of combined shipment from point of origin to final destination point with shortest distance to origin. A combination move requires that the entire shipment is picked up within 24 hours and is made up of a minimum of 4 component parts. The way this is billed depends on the distance of the move. Like a split pick-up or split delivery move, 100 miles or more is considered a long distance move and is not charged on an hourly rate, but is charged by shipment weight. Loading and unloading time for each component part. Double Drive Time between origin of any of the component pieces and the destination of any component via remaining point of origin and point of destination. Total weight to shortest distance via remaining point of origin and point of destination. Double Drive Time (DDT) – still confused? You are not alone. Make sure you discuss how your move will be billed with your contracted moving company. Remember, this line item on your final bill is required by the Max 4 Tariff law by any company regulated by the CPUC. If you are not charged Double Drive Time, you may be dealing with an unlicensed and uninsured company – this is not a risk you should be willing to take. Take the time to do your research and understand what makes a moving company legitimate and what DDT means for your move. On Point Moving is a San Diego VETERAN-owned and operated moving company. 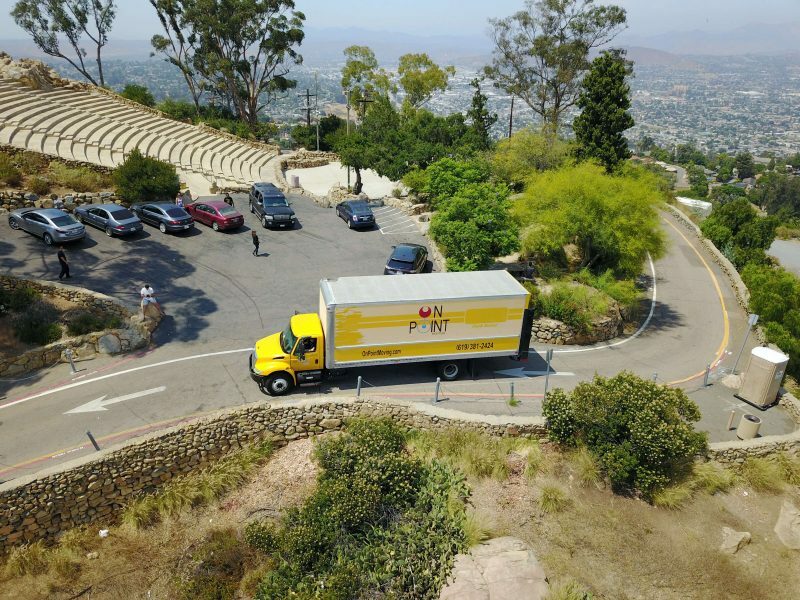 We primarily serve all of San Diego County; we also regularly move to and from Orange County, Los Angeles, and Riverside areas. We offer a wide range of services – from full service moves, to DIY moving and storage.